Northern Tablelands MP Adam Marshall with service executive officer Michelle Harrison where hopes are high State Government funding will help it expand services. 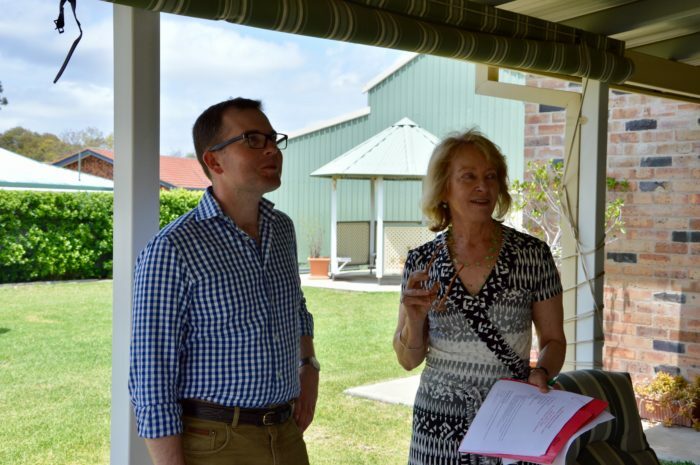 A MOREE aged and disabilities group is hoping new funding under a State Government program will help it expand its respite services to help more clients – and Northern Tablelands MP Adam Marshall has added his weight to their application. The Moree Aged and Disability Service is hoping for good news on the grant application next month so it can add another room to its centre and qualify to become an approved provider for overnight respite to more people. “The service wants to add another bedroom to the respite flat area in the building and I’m completely supportive of their moves to do that, because it will allow them to help more people,” Mr Marshall said. “At the moment they have a two-bedroom respite facility but to qualify for funded overnight respite, they need to have three bedrooms to be eligible. Mr Marshall toured the Edward Street property of MADS recently and caught up with new executive officer Michelle Harrison to see at first hand just what the funding could achieve. Ms Harrison told him they were hoping for “a silver lining” for their plans to extend the service to more people and had applied for just over $41,000 under the Community Building Partnership program for this year to help it achieve that goal. “We have $5,000 set aside to go towards that so we are really hopeful that with Adam’s support we can get a substantial grant to start on the project,” Ms Harrison said. “We service over 200 clients in Moree and Mungindi and the organisation has grown from its establishment as Gwydir Home and Community Care in 1988 under a Moree Plains Shire Council Committee. “Initially that was as a Moree town bus service gradually expanding to add aged care in 1991 and Meals on Wheels in 1993 and it was incorporated in 1997. Mr Marshall said he was hopeful there would be good news for the service and expects an announcement next month on the latest round of grants. “This is one of those wonderful practical services that actually do great work on the ground for some of our elderly and most disadvantaged people and I’ve been right behind this application from the very start,” he said.